I realise that what started as a genuine intention to get people to enjoy the sights and spectacles of Bristol has instead turned in to a series of rather irresponsible pub crawl posts. Oh well, if Bristol does one thing better than most places in the UK it’s provide an amazing variety of drinking establishments, whether your tipple of choice be a fine craft beer, a rich Bordeaux or a cloudy pint of scrumpy. St Michael’s Hill in the centre is probably the highest concentration of great pubs in this fine town of ours, and therefore perfect for a pubcrawl. I’d advise starting from the top, mind. It’s a wee bit steep, so not the most appealing route if you’ve imbibed a few strong ales. From here not only do you get to start with two of the best pubs on the route, but you also get to kick off your conquering of St Michael’s Hill with a stunning view across the city and a game of bar billiards at the homely and hospitable Highbury Vaults. Still split in to a main bar and a saloon with dark wood panelling and some great traditional pub snacks, the Highbury Vaults is the sort of pub that I would live in if I had the chance. The whole place feels very friendly and hidden away, with several little nooks nestled around the small premises. There’s also a great beer garden out the back. Once you’ve emptied your glass at the Vaults, it’s across the road with you to a bar at the other end of the interior design spectrum; Beerd. A recent addition to the hill, Beerd arrived with its colourful seating and amazing array of craft beers in early 2012 and has since been a popular choice for booze-happy students and beer conoisseurs alike. 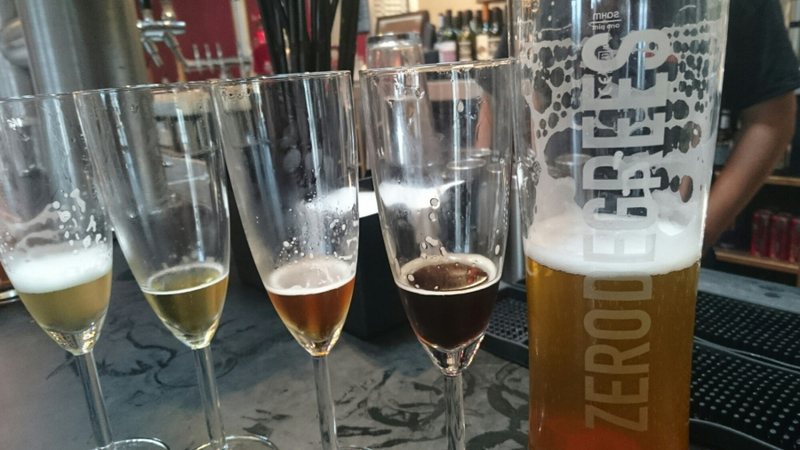 They regularly rotate their stock of local ales and beers alongside some impressive rare choices from further afield. If you’re looking for an education in all things beer, you won’t find better. Their pizzas are pretty nifty too. A couple of doors down is the slightly sophisticated but cosy Cotham Arms – home to some comfy seats and cheese toasties on the menu! Once you’ve stocked up on ale and cheesy stodge, it’s time to move a few yards along to The White Bear, a rather pleasant student pub with gastro aspirations and a lovely little theatre hidden upstairs. Now that you’ve given your calf muscles a bit of a work out on the city’s slopes, it’s time for a reviving drink at The Robin Hood, one of the most underrated pubs in Bristol. Small but perfectly formed, the RH always has an almighty selection of beers and ales from all over, and the staff are always happy to share their knowledge and make recommendations. Next, it’s down to the more scuffed of the St Michael’s establishments: The Scotchman and his Pack and The Colston Arms. Set over 2 floors, The Scotchman (currently closed) is usually a bit more subdued than the rest of the pubs along this stretch but has its own charm. Next door is The Colston Arms which has a better selection of beverages in the shape of some great ales and ciders from Wales – the place also gets quite lively when there’s sport on, especially if Wales are playing! Kudos for making it this far, you’ve now made it to the bottom of the hill and are in Central Bristol proper. Where you decide to take your night from this point on is up to you (will it be to the bustling and brawling chain pubs of Corn Street or the candlelit wine bars of Clifton?) but before you make any big decisions it’s probably wise to duck in to Colston Yard for a celebratory drink. The Bristol Yard is situated opposite the Children’s Hospital and has a focus on craft beer and cocktails – plus a menu focused around burgers and other hefty fare such as ribs and smoked chicken. What better way to finish a pub crawl of such decadence than in a microbrewery? Zero Degrees is a large and slightly cold space which lives and dies on how busy it is; when the place isn’t bustling it has about as much atmosphere as the departure lounge at Gatwick Airport, but when there are a few heads in the room it definitely feels like one of the trendier place to be in the city. There’s a nice balcony for you to take in the view whilst supping on one of their homemade beers and the food menu is quite impressive too. I’d recommend their Pilsner or Mango Beer – lush. Next Stop? Either progress in to town via the The Gryphon (bring your tankard for them to hang above the bar – ale afficionados are particularly welcome) and The Hatchet (metal horns!) 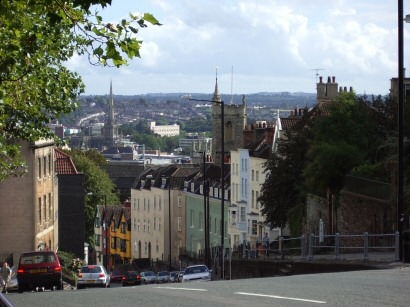 or up towards Clifton via The Ship Inn (a snazzy pub with a good weekyl quiz) and bargain student lair The White Hart. How fun to read of places I know and love online or once, instead of that weird kind of hollow, vicarious feeling I get when people describe something awesome but unnattainable. Yes. Bristol. How I love thee. Thoroughly enjoying your posts (I, too, am a fan of eating), however I have a correction to make for your St Mike’s Hill drinking route – you missed one of the best kept secrets of all: The Green Man. The Green Man has lots of lovely local, organic beers, ales and spirits (actual sloe gin with an added lavender kick is just unmissable) and is tucked away just round the corner from the maternity hospital (on the road that runs opposite Alfred Hill). It’s quiet, it’s old-fashioned, there’s normally a dog of some kind, and I’ve not yet had a drink in there I didn’t think was utterly delicious. Thanks for the comment, I will most definitely check out The Green Man as soon as possible – I’m now living locally so I have no excuse! Glad to hear you’re enjoying the blog. *Apologies for typos. The Boy had me up at 6am and I’m not quite up to speed with, you know, anything, yet.